Buy CISS Brother DCP-110C and make 30 times more quality prints for the same money! Pay only 0.04 USD for A-4 full color print! The first and the main point of buying Continuous Ink Supply System is its efficiency. CISS for brother dcp-110c is one of the best representatives on the market. Mistakenly the majority consider this system to be appropriate only for printing high volumes. It suites the needs of everyone who prints more than few times a week. If so, you should know how extremely expansive printing may be. But it is all about original cartridges and changing them again and again. With CISS you don't think about costs. Before ordering, just check the model you need, for example ciss for brother MFC-240C. Absolute compatibility guarantees easy set-up and convenient use. All chips are the same as original one due to the company constant working with every flow of change printer manufacturers introduce. Continuous ink system brother dcp-110c also consists of four tanks for inks and a silicone tube. A set itself goes along with a syringe, which helps to fill in inks, and air filters to prevent inks from spoiling. The inks are added to printing head constantly and if using appropriate inks, you get even better results as the trail don't let colours mix. As to the ink, it must be dye-based one. 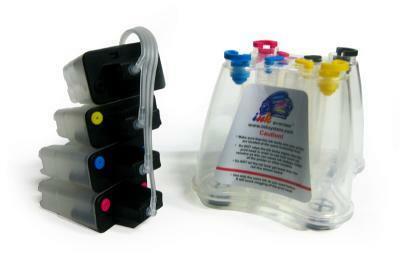 We highly recommend INKSYSTEM made inks as they are specially invented to suit CISS. It doesn't matter if you order ciss for brother mfc-465cn or cis brother dcp-110c the inks will compete both of them. It is used everywhere starting with homes and up to professional laboratories for text, graphic, image and photo printing. Using ciss brother dcp-110c let to print even black and white text cheaper than laser printers do. And price of photos made at home absolutely differs from studios'. Let's count: $0,02 per photo. It doesn't influence internal functions, but provides cleverer way of ink consumption. At the office you may print booklets, pricelists, schedules and many others at the amount required. One color copy of an A4 format costs $0,01. Feel the difference? Continuos Ink Supply System may be used on almost all ink jets with inbuilt printing head. This way CIS brother dcp-110c is applied to such a printer as the operating life of dcp-100 printing head is almost unlimited. But it doesn't mean you should not control quality of inks and overwork it. It may be used even in professional printing as we have mentioned. As the cost is twenty times less, professionals easily reduce costs and enlarge contribution margin.